An increasing number of job postings online, but which ones are unique? To make sure we provide our customers with data of the highest quality we’re constantly working on the improvement of our products. 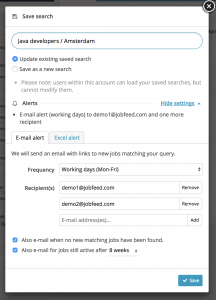 Recently, our team has been working on further improving the deduplication method within Jobfeed and made the feature to save your search and set up an email alert more intuitive. More and more jobs are posted online everyday. To get a good overview of the labor market, it is important to differentiate between unique jobs and duplicate postings. With this in mind our team has been working extensively on ways to further improve our deduplication method. Jobfeed now detects similar jobs more efficiently, and duplicates of duplicates are more easily identified. 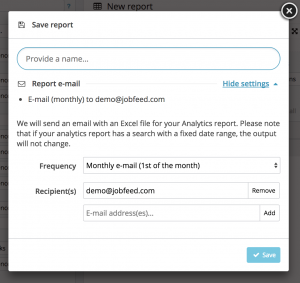 As a result, Jobfeed’s efficiency is improved and search results for unique jobs are more accurate. The new and optimized deduplication method will be released for the Netherlands, Germany and France just before Christmas and will also be applied to all historical data. For other Jobfeed-countries it has already been released. Besides a new deduplication method, we’ve also improved our method to detect whether a job is still active. When using the checkbox ‘only active postings’, we will always return jobs for which at least one posting is still active. 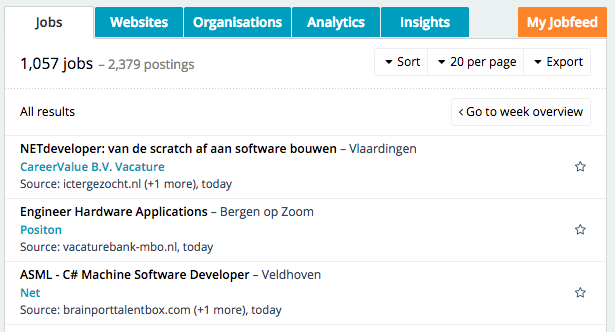 As a result the number of active jobs within Jobfeed increases. What will change in the Jobfeed Portal? 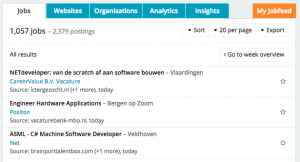 Users of the Jobfeed Portal no longer need to specify that they want to search in duplicates. The option to search in duplicates has been removed from the search form. Instead the results page will automatically display the numbers of unique jobs and postings, providing you with up to date and relevant insights. Want to save your search, and set up an email alert? We’ve redesigned the feature, making it more intuitive to save your query and set up an email alert according to your own preferences. Take a look at the new feature! Do you have any questions regarding this new release in Jobfeed? Don’t hesitate to contact us!